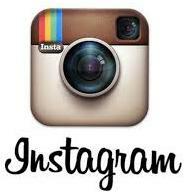 Feedback: 160 comments - leave yours! In this article I prepare twice this quantity. The Simili twins call for pancetta or Parma ham, which you need to finely dice. As you'll see later, I used half prosciutto and half Valaisian petit lard, a local flavorsome bacon. Prepare the aromatic garniture. Peel your carrot and onions and garlic clove if using. 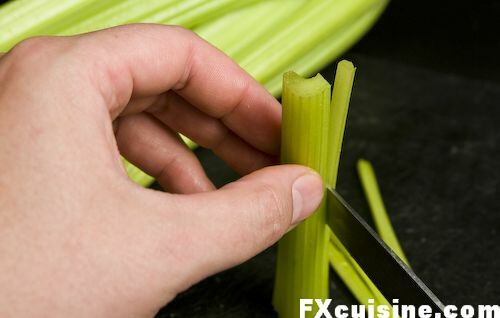 Trim and wash a celery stick. 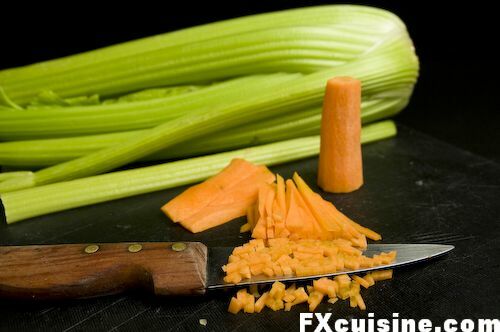 Cut the carrot lengthwise into thin slices, then perpendicular to that cut to make long sticks and finally perpendicular to the two former cuts to make an orange sea of tiny carrot cubes. Proceed with the celery stick. Be thorough, roughly cut cubes will show in the final product. 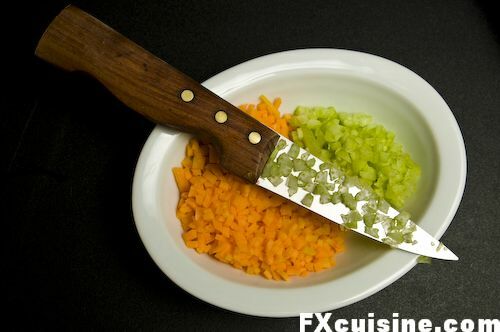 Finely dicing these vegetables is a way to show respect to the recipe, the produce and your guests. Reserve in a small bowl. If you think chicken liver is best left to the dogs, I won't blame you. 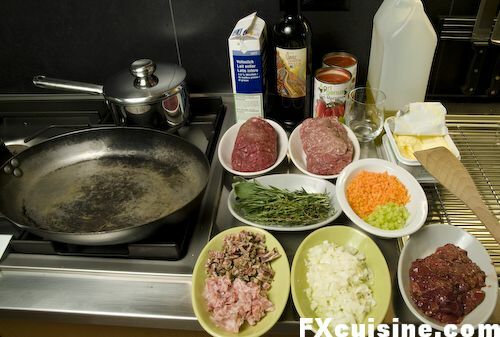 But in ragù bolognese, it is an essential ingredient. The liver taste melts and disappears into the whole, bringing a slight hit-me-back taste. Nobody will be any the wiser unless they are from Bologna. If you are doubtful, please try with a little piece, for Daddy, and you'll see. Wash carefully the livers to remove the slightest trace of the greenish bile, then crush the livers under a flat knife and chop them. All the ingredients prepared in their order of appearance (bottom to top and left to right from the bottom left) pancetta, onions, liver, herbs, carrots and celery, meats, butter, milk, wine, tomato and oil. On the stove my largest saucepan ('stick', rust-sensitive iron pan from the legendary Burgundy restaurant 'Greuse' in Tournus. Behind, a smaller pot heats the chicken stock. Another one will heat the milk. Aspiring home chefs, hear me, take some time to read your recipes several times before you start. You want it firmly commited to memory, like a soldier who needs to field-strip his gun in the heat of battle or a pilot who needs to pull a dozen controls in under 5 seconds in a gusty landing. If you lay all your ingredients neatly and close to your stove, you will not only increase your recipe's chance of success. You will also make the process much more enjoyable, with you celebrating the beauty of life and nature on the altar of your stove. How would this liturgy look if you work from greasy papers and dirty bowls? Place your widest frying pan on a very hot burner and add 2 tbsp oil with 2 tbsp butter. Why a wide pan, and why mix oil with butter? We will soon sauté the meat to develop its taste through browning - Maillard reaction. 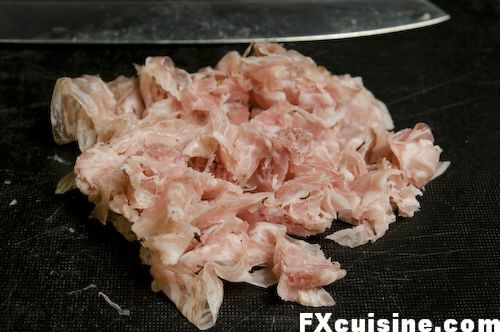 If we place too much meat in too small a pan, the meat will render its juices and that will prevent any browning. You'll be boiling your meat in its own juice. 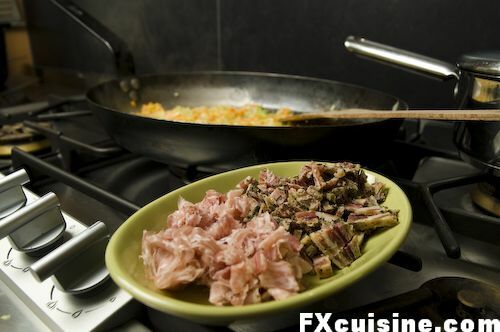 If you have a small pan or a weak flame, you'll need to brown the meat in several batches. 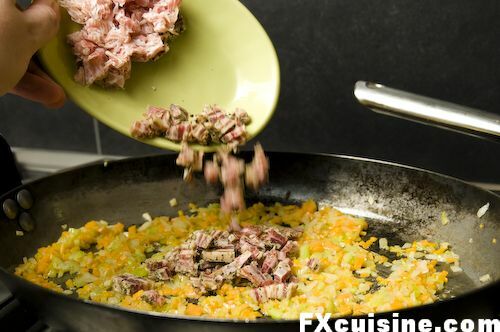 There is no point in doing this unless you can get your meat to turn brown, so if you'd rather ignore this recommendation (which comes directly from the Simili twins), you could ignore the meat sautéing altogether, whith a much less tasty end product of course. 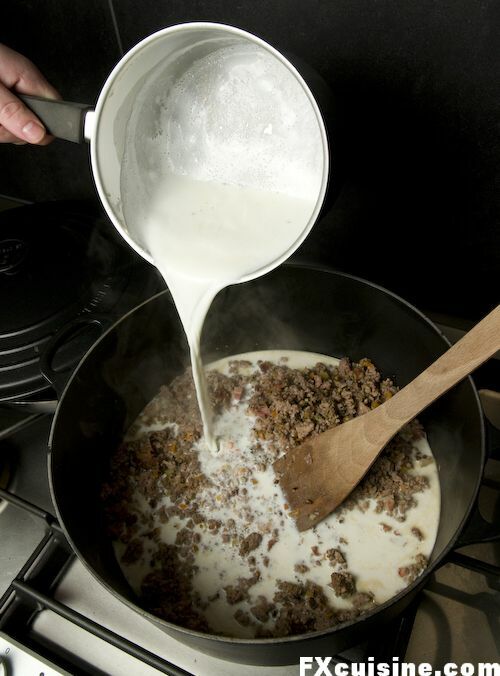 We mix the butter with oil so as to increase the temperature beyond which the butter will burn. 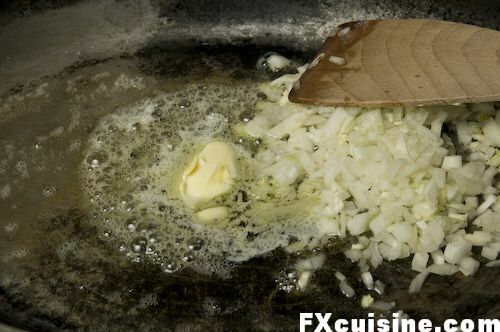 Add the onions and fry until the onions are soft and their water has evaporated. You do not need to wait until they are brown. ... and sauté over high heat until they start to brown. While this goes on, prepare our next ingredients, the pancetta. On the picture I have Italian pancetta in the front and Swiss air-dried petit lard in the back. ... mix and sauté to complete our aromatic garnish. Push everything on the side. My pan is oval-shaped and designed to let the chef (tonight, I am the chef!) 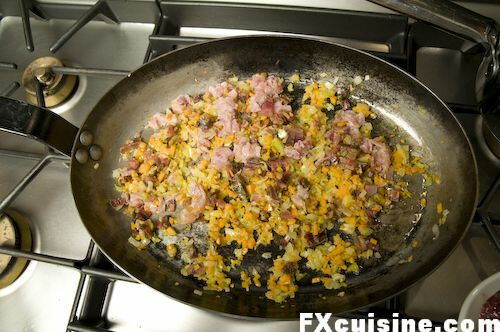 keep some ingredients hot while he cooks others on the part of the pan directly over the burner. If you have a small pan, don't worry, there is hope. 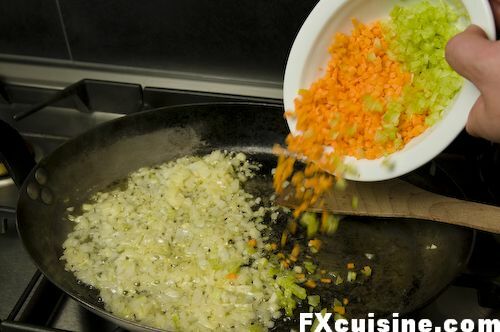 Just remove the aromatic garnish (onion, carrots, celery and bacon) to a dish, cover to keep warm and continue. 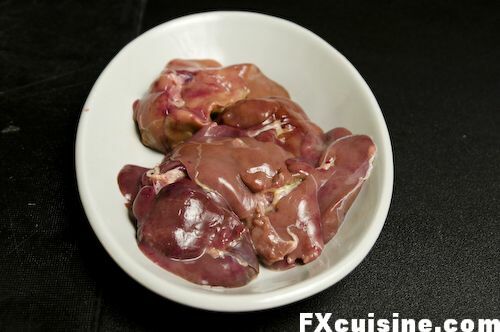 Add the liver and turn frequently as it coagulates. Use a wooden paddle to break it into tiny pieces. 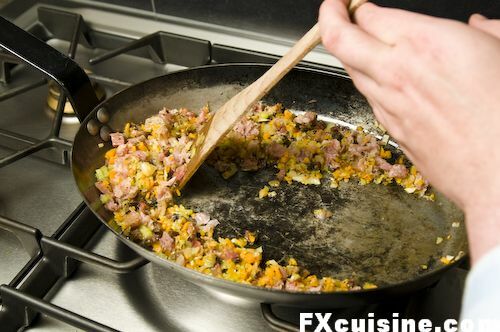 Place the part of the pan that is free directly on the burner and add part of the ground meat. How much should you use? 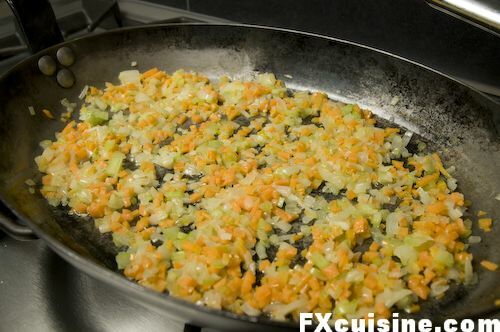 Not more than what can cover the pan's bottom evenly. You need to keep that pan hot! 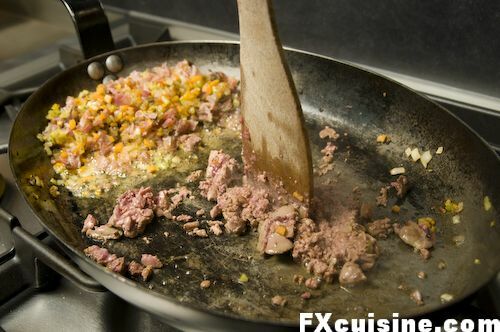 If you put too much meat, the pan's temperature will be absorbed by the cold meat and you won't manage to brown it. 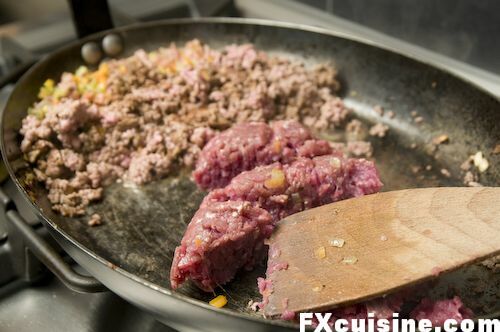 If in doubt just use a lemon-sized chunk of ground meat to start. We will do this in several stages.